Earlier this year in mid-May, I received an invitation from Evan Mitchell, the Musical Director of the Kingston Symphony Orchestra, to create a small suite of works inspired by a special performance of classical music compositions, all of which incorporate birdsong. The three pieces to be performed are: Jennifer Butler’s “And Birds do Sing”, Mozart’s Piano Concerto No. 17, and Beethoven’s Symphony No. 6 ‘Pastoral’. 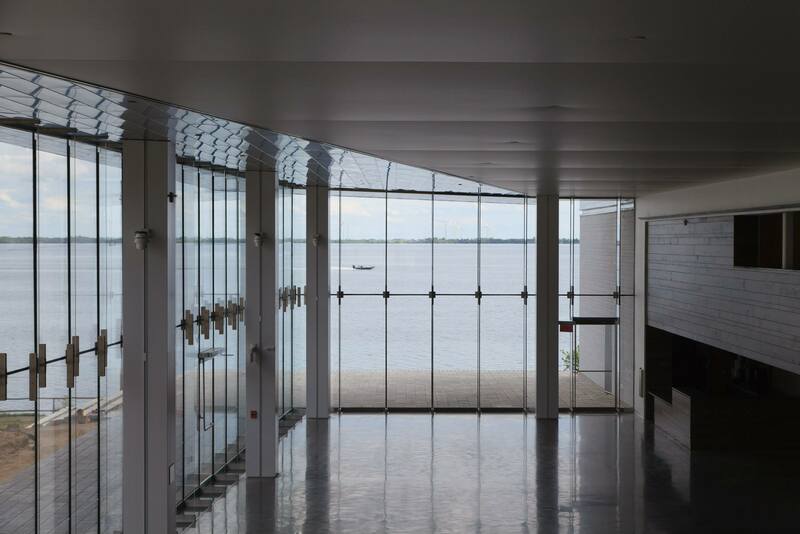 The concert hall is the Isabel Bader Centre for the Performing Arts in Kingston, and the lobby is large, beautiful, open, and enclosed by floor-to-ceiling glass overlooking Lake Ontario. The performance is scheduled for March 5, 2017. I know NOTHING about classical music (picture inner struggle here), but YES struck me as the more interesting option in this case… a new experience! So much to gain, so little to lose! I love birds! So I said YES. And the invitation gave me plenty of time – an eternity, it seemed! The director provided links to the music, and programme notes to explain the composers’ creative inspiration for each piece. I listened to them while working on other projects, read the back stories, and then hoped something magical would happen. When all else fails, I think the greatest motivation possible is a deadline. Having lots of time to do something doesn’t necessarily make the result any better – in fact, it can have quite the opposite effect. So, eager to quit procrastinating, I gave myself a two week time window in November 2016 and trusted I would get there somehow. How to begin? Obviously, listening (with intent) felt like the best first step. I recorded my main impressions as they progressed: which colours came to mind? how did the music fit the background story? How did I feel along the way? what might all those instrument sounds LOOK like? I started thinking about the physical form of the pieces. How on earth to capture the various movements and the passage of time? After all, music moves through time but visual imagery needs to encompass everything in one shot. What about this: because a musical piece builds on itself while it plays, and previous sounds lodge in our memory even as we hear the new ones, perhaps the pieces should be tall and vertical, and read from the bottom up! It didn’t feel right to use representational imagery alone – I wanted to show the feeling and colour of the sounds and didn’t want to limit my visualization. Abstracts they must be! 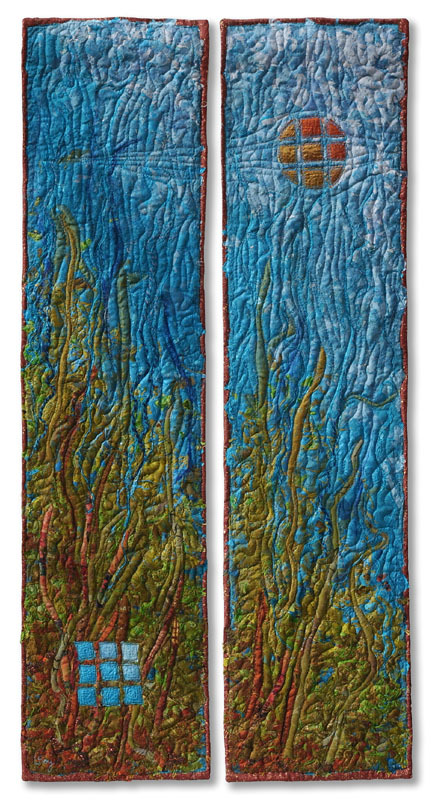 As I began the drawings, I also realized they must be quilted wall panels, as the designs resisted being hemmed in by frames. And technique? It felt most logical to plan for a loose (might we say, imperfect?) 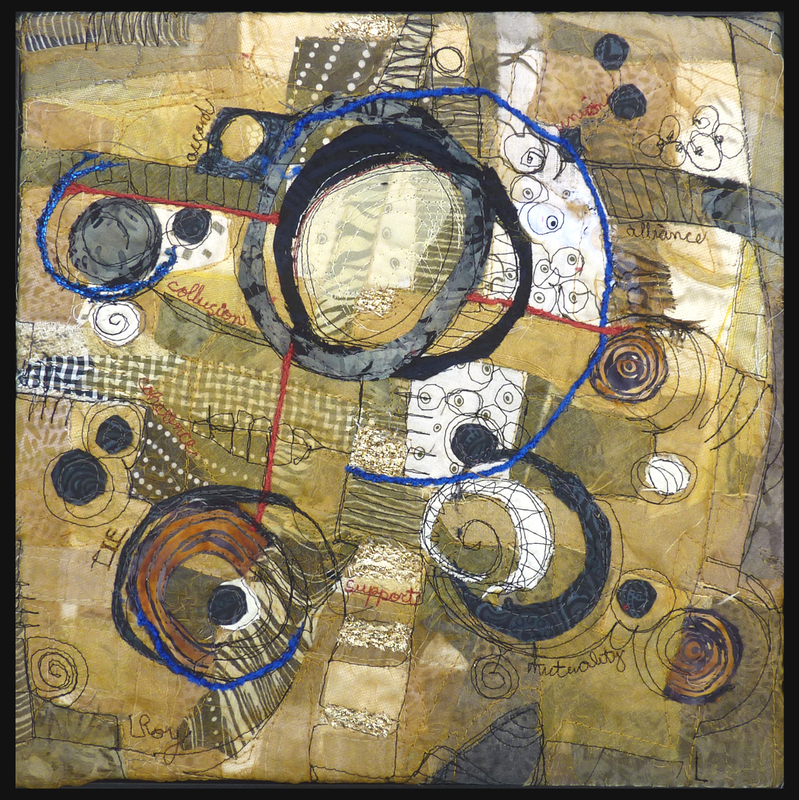 form of fabric collage that would allow plenty of freedom of shape and background changes. It takes hundreds of small decisions like this just to get to first base with any new project. Sometimes I think this is why we tend to procrastinate – it’s hard work and it’s scary! At times, the answers are easy and obvious, but other times we must make a leap of faith, hoping experience and wisdom will serve well. I decided to begin with the Mozart which was the most accessible to me: a rich melodic piano piece. 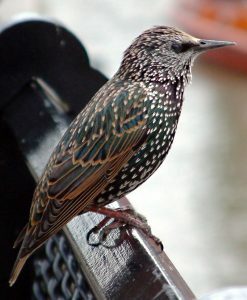 It had a charming story to match: Mozart tried to teach the theme to his starling, but the bird couldn’t get it quite right. Mozart was so tickled he wrote the bird’s mistake into his journal. In the design of this wall panel, the starling became the central motif, with the three movements of the concerto settling around him in swirls and swoops of colour. The second, by Canadian composer Jennifer Butler, is a modern piece written in 2010, and is the most abstract of the three compositions. The sounds begin with drums in cool waves, dark and tumbling and pierced with high flutes, eventually resolving into a lullaby composed for the composer’s daughter. What does a drum sound look like? Maybe circles… oblong circles? And flutes…. might rise up in long strands? 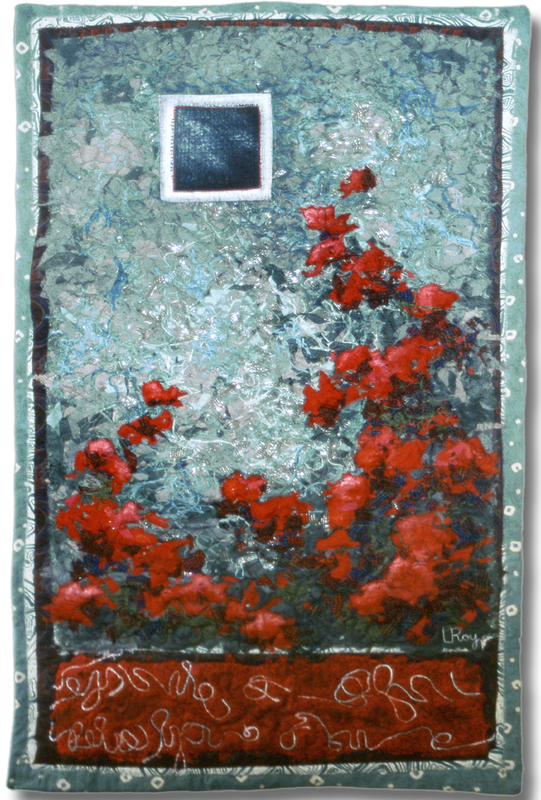 The overall feel of the piece was cool and spring-like, hence I stayed with blues and cooler tones. 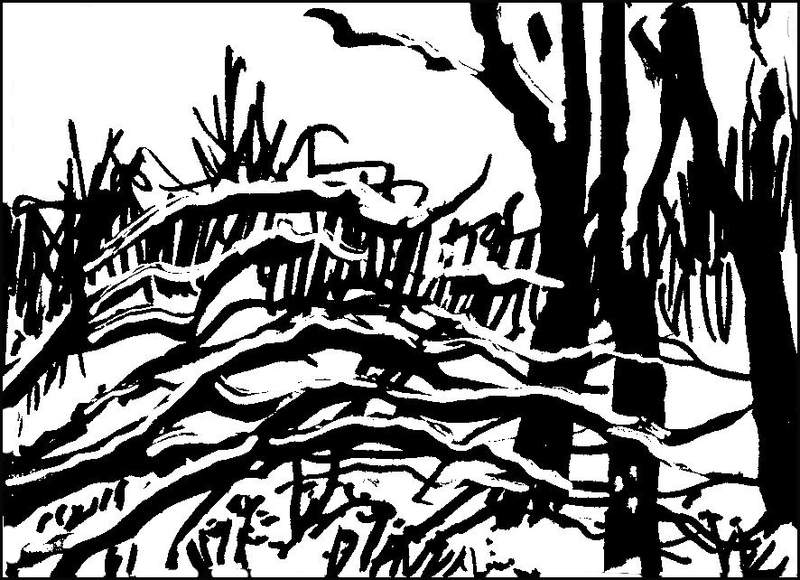 The panel begins at the base with the rhythm of the drums, then another layer, upon layer until the clear notes of birdsong and lullaby surface. The Beethoven piece was the most complex. 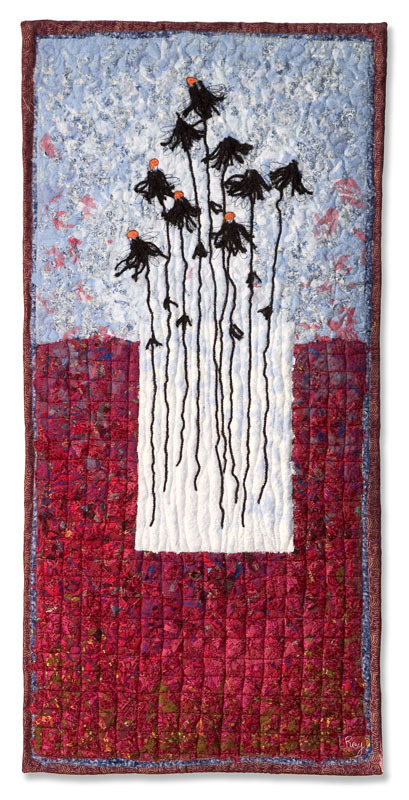 Although I incorporated elements of the movements, like a walk by a stream, a storm, birds, and a reference to folk art to represent a peasant dance, I was more interested in the smoother cadence and feeling of the performance, the melodic swings and eddies. The sounds were less emotional than the previous two pieces, so I used a more sophisticated colour palette. 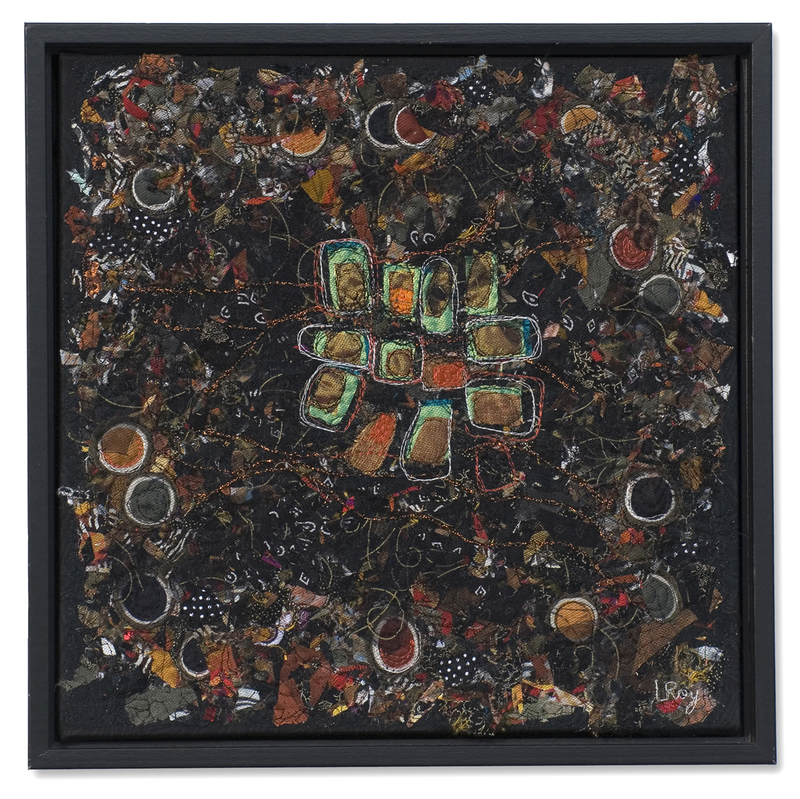 Each of these pieces grew and evolved completely differently. In focusing on and working with them, I learned something intriguing about classical music: that, just like visual art, it begins with a personal story – now I will listen for it. And perhaps when the music lovers at the concert see my interpretations, they might learn something about abstract visual art. My fondest hope is that the music provides an entry point for understanding the abstract imagery, and in return the visual art enriches the appreciation of the music. 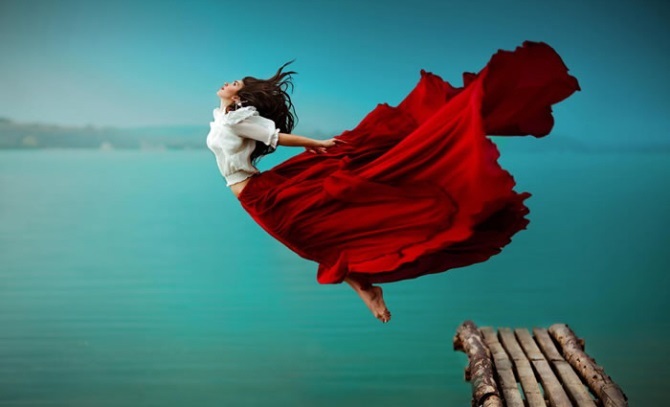 As with many other occasions when I took the leap, I enjoyed every single minute, and the effects will last a life time! For purchasing information, please click HERE. All the photography of my work is done by my very talented and dedicated husband, Janusz Wrobel. Last week I posted an ‘advice for artists’ article on my Facebook Page about the importance of saying NO in order to carve out time for ART. “Creative People Say No” is an extract from Kevin Ashton’s new book, “How to Fly a Horse — The Secret History of Creation, Invention, and Discovery.” In this article, creative people (all men, by the way!) were quoted on their use of NO to build walls around that elusive time space needed for creative exploration and production. But, at least from my point of view, the reality is more like this: picture a studio smack dab in the middle of a busy highway, with lanes curving around this tiny oasis. Is it possible to ignore the sounds of traffic, the honking, the emergency vehicles and the multi-vehicle pileups occurring just outside? Not to mention the distractions coming from within: the trusty iPad twinkling away, and the radio announcing the latest political dramas? The main difficulty, especially for women, is that we thrive on community and connection. Tuning it out, while also remaining open to creative flow, is a creative endeavor all its own. And what does success mean anyway? Wouldn’t this obsession with saying NO lead to unhappy choices in a balanced life? So I am proposing to turn it around. Instead of selectively saying NO, why don’t we selectively say YES? Before I explain, maybe I should first define success. In the art world, success is the ability to carry through from inspiration to product, and to have that product reach and move an audience. (It is NOT about financial success, which is another animal altogether, distinctly separate from art creation.) I am completely confident in saying that yes, success in the art world does indeed contribute to happiness in the same way any successful interaction does, because it is satisfying to the artist and to the viewer. Communication is the fabric that holds society together. 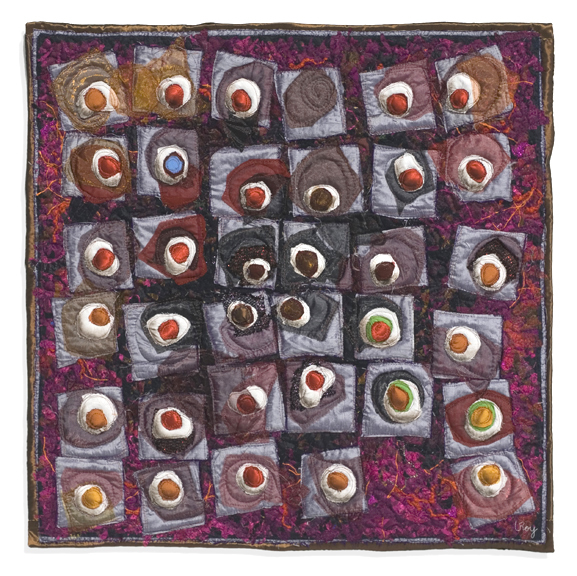 A strong, single minded approach to art-making is a worthwhile pursuit. At the same time, saying YES to one aspect in life means something has to give. We must decide what we are willing and able to live without. My father always said that it doesn’t matter what you choose, just make your decision and never look back: accept the whole package, positive and negative. So I try to remember that not every single part of my life is going to be perfect. I made a career decision with all my heart and soul, and like a marriage, for better or for worse. 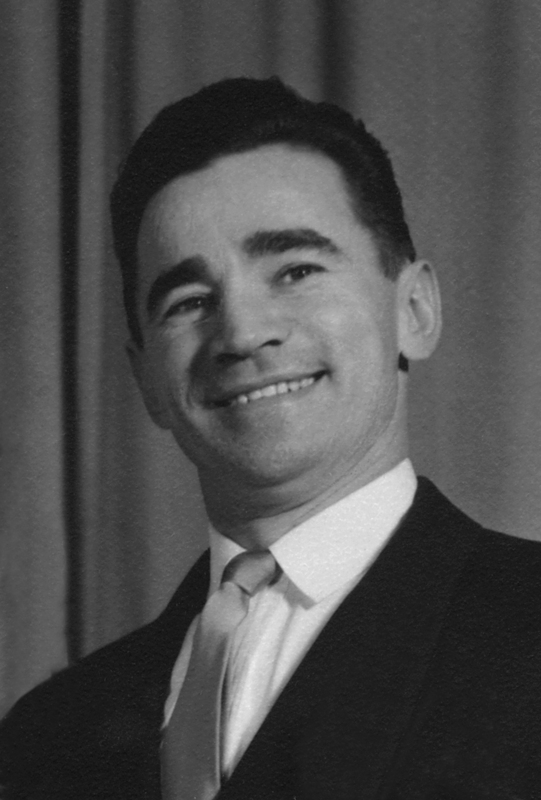 Wilfred A. J. Roy, my greatest inspiration in life. Still, none of us is a ‘single purpose creature’. We come from society and we die with society. I believe there is room for a committed, yet balanced, art life. Therefore, for good measure, we need to make room for a few more hard YESes. Taking care of my Mom and babysitting our grandboy, being there when I am needed for my family. Time with a select circle of friends. 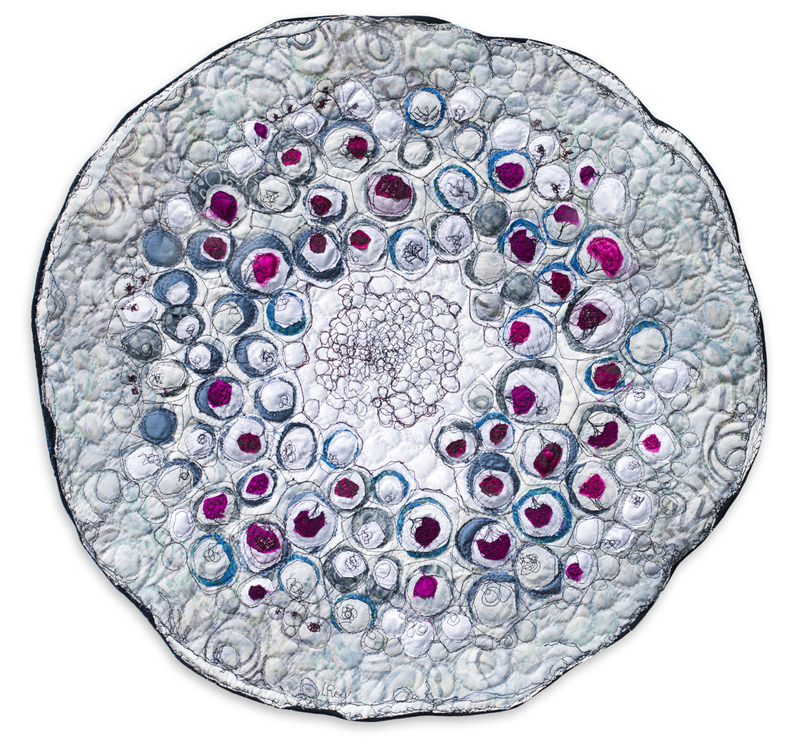 This circular quilt represents connection. YES to helping and supporting colleagues, both established and emerging, to writing a blog because it helps firm up my own thoughts, and to keeping an active Facebook Page. YES to all the business/client time that arises. Each time a request for my time and energy comes in, I ask: does this move my art forward, does it support my personal ethics and vision and does it draw on my strengths? Is it an efficient use of my time? Saying YES to ART led to my decision not to participate in committees, societies and group projects. I am not a primarily social creature and the stress was deadly for my work. Here was one solution: our local Carnegie Gallery requires member artists to contribute a number of hours per year, either by joining committees or taking on other tasks. Drawing on my independent streak, I created and managed their first Facebook Page. This meant I worked from home, it segued nicely with my own online time, and it saved them having a non-team player at meetings! For exhibition requests I ask: does this gallery or juried show further my exposure, is it locally relevant, and does it contribute to the perception of quality in the public mind? The answers help me be more selective. I gauge commitments against how much time and distance is involved. Of course, committees are necessary and someone must fill galleries and teach workshops: these are other artists’ YESes, and I feel quite comfortable leaving them to it. Cooking and enjoying good food and wine, time with select friends, long walks, quiet evenings reading, and gardening. Which means: fewer parties and group activities, less travel, less time shopping, a not perfectly clean house. The resulting NOs have become so automatic I don’t miss them or waste time thinking about them. In the summer it’s a giant, defiant YES to my garden and my home. 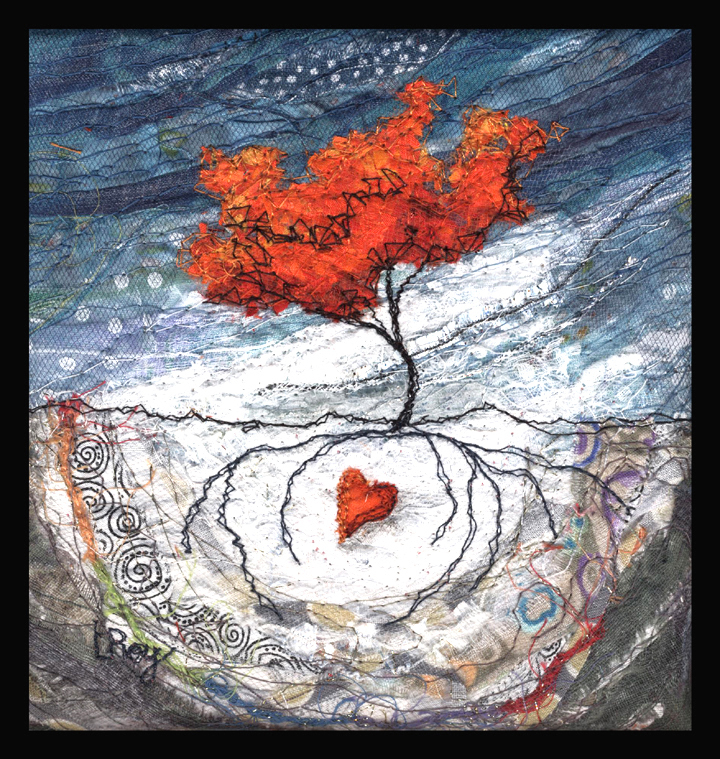 Instead of asking “How much less will I create unless I say NO?” I ask myself, “How much more will I create if I say YES?” In my art practice, saying YES empowered my choices. If we choose our YESes wisely, the NOs will justify themselves. Recently I had a dismaying experience with another artist. She had posted an image of mine on her site, claiming it as her own, with my signature removed. She had purchased that tiny piece from me in 2013, and to add insult to injury, she was aiming for a profit at nearly twice the price. And even I can’t sell my 6×6” for $200! Her site eventually shut down after several emails from me, and a groundswell of support from artists and friends all over the world who saw the original post on Facebook. Note the signature, hard to miss! Hmmmm. Interesting lack of signature. This specific kind of issue is rare, and it is relatively easy to prove and to deal with. A far greater threat, and much more difficult to manage, is copying – a pervasive problem in this digital age, where artists and perps do not know each other or travel in the same spheres. But I’ve never been one to wring my hands over this stuff. Worrying about where I show my work, whom I show it to, where I post my images, who shares them, who sees them… it’s impossible to control! Pinterest alone is a giant copyright sucker. Yes, I have had work stolen, and yes again, copied. It’s probably still happening as I speak. But who wants to keep every single thing they make under the bed? 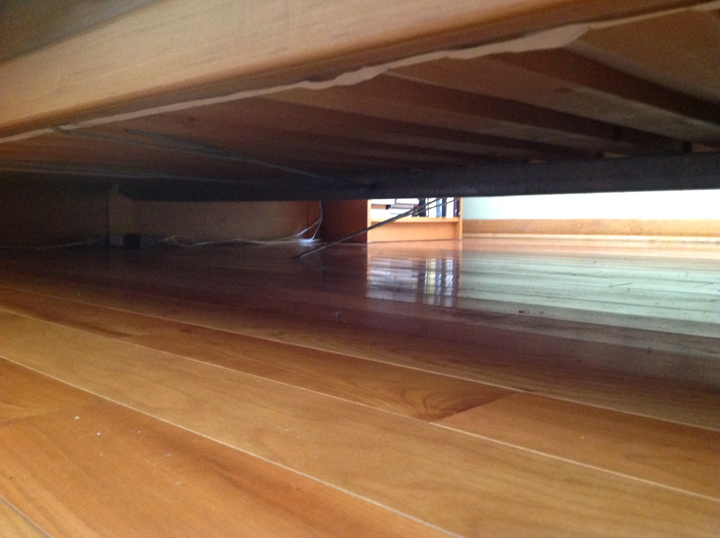 There is nothing under my bed. Under my bed, minus the dust bunnies. Isn’t photoshop wonderful? This post won’t be about Copyright. I am not a lawyer, and the law varies with location. I leave this up to the pros. 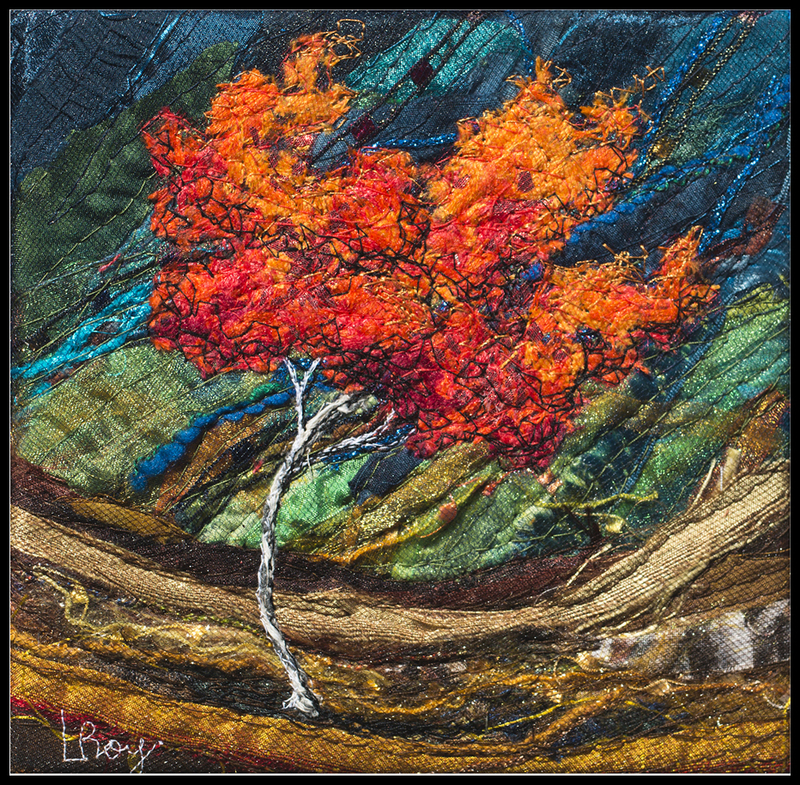 For many years I have been a paying member of CARFAC (Canadian Artists Representation of Canada), an organization devoted to helping professional Canadian artists gain and maintain respect and fairness in their business. I strongly feel that my support for CARFAC is a kind of insurance for my own and other artists’ integrity in a world that often seems devoted to undermining our work and lives. 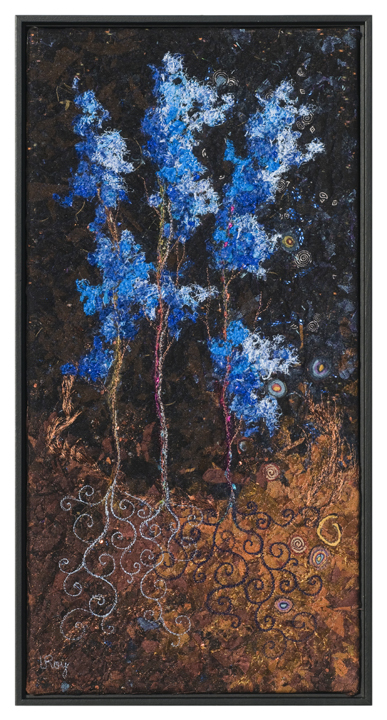 If a visual artist is in need of legal advice pertaining to her practice, she has access to an extensive connection of printed matter and lawyers via CARFAC. I don’t begrudge them a penny. LOVE. However, my recent situation got me thinking about how artists can quietly protect and defend themselves should the occasion call for it, without going overboard and feeling nervous every minute. My answer is to keep good records. People always look skeptical when I tell them that 50% of my work is administrative. “Really? Isn’t art supposed to be all about creativity and fun?” Or better yet, “Isn’t the true artistic spirit crushed by administration?” Interesting that administration doesn’t seem to crush health, food production, sports or education. I decided long ago that my creativity includes and embraces administration: I just do it creatively (ie with tea, chocolate, music, or, unfortunately, wine), and I keep it super simple. 1. Sign work on the front. A contrasting thread in the bottom left or right corner works well. So important if you ever need to prove it’s yours from a photo. In my aforementioned situation, I had solid proof that the artist had removed my signature because I had an original signed photo. Otherwise I had no leg to stand on. Signing: I made it and I take full credit for it. 2. Which leads us to photos: I take photos of every piece made, every single one, before it leaves the studio. Even bad photos are better than nothing. It’s not always possible to get awesome photos of every single thing, but I’ve made a habit of getting a clear shot that includes the signature. 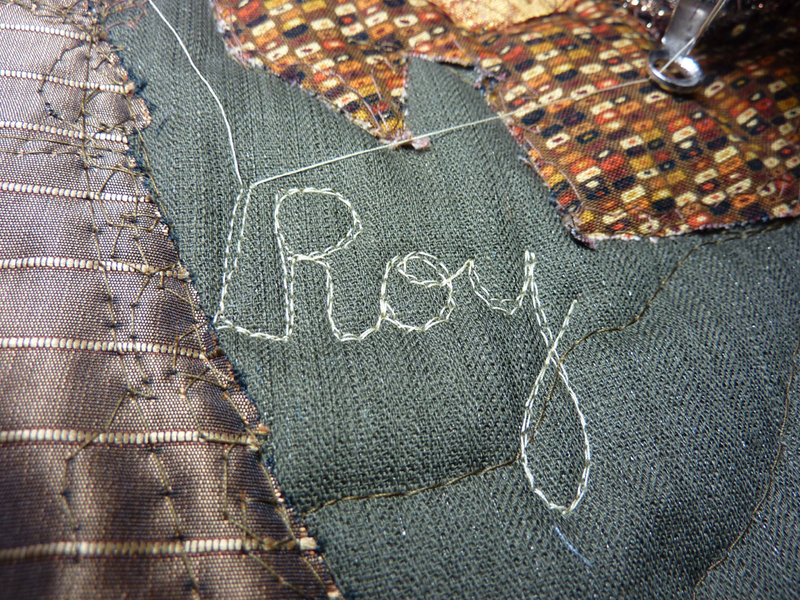 Cameras and devices embed the date taken, so I try to photograph a piece soon after finishing it. Then it is stored in a file with its title, year and size in the filename: ie SPRING STORM 2014 16X8. 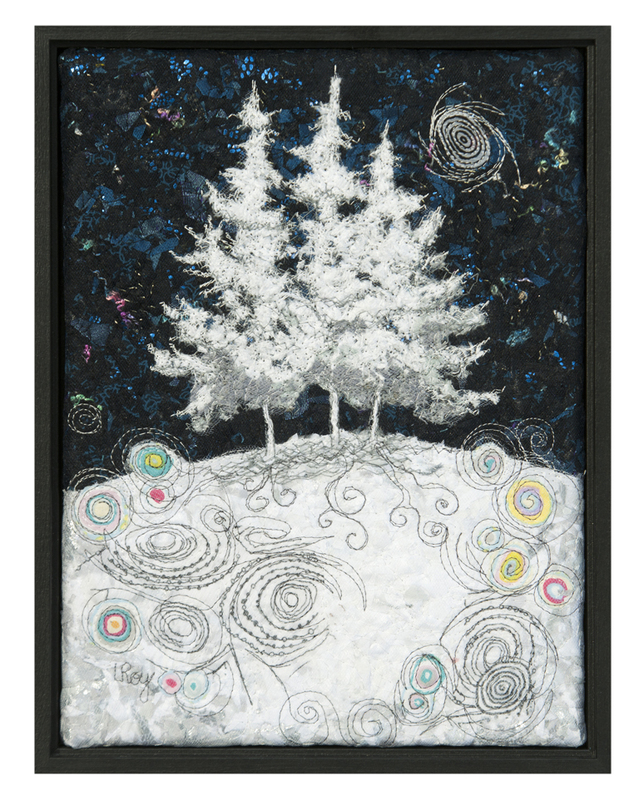 The added benefit is that the title, date and size are right there, ready to send off to a client or gallery. And the image is easy to find alphabetically or though a computer Search. 3. Each piece needs its own title (Untitled #22 is better than nothing) included somewhere on the back of the piece or framing structure. This way, if a work is physically stolen, there is also a title to work with. Some artists assign a special numeric system to their works. It’s one of those great ideas I will never personally implement, but I’m all for it. I also just heard about microchipping artwork. Okay, again, not for me but worth mentioning. Thanks, Evelyn! 4. Keep accurate and updated records – title, size, year, date sold, where it sold, to whom if possible, method of payment and amount it sold for. I use a Word table, although were I to begin again, I would use Excel instead. I start a new one every two years. Below is a section from my PIECES 2014-2015 Word file. I fill in whether the pieces are sold, donated, exchanged or uh, decommissioned. Very easy to retrieve and check years later. 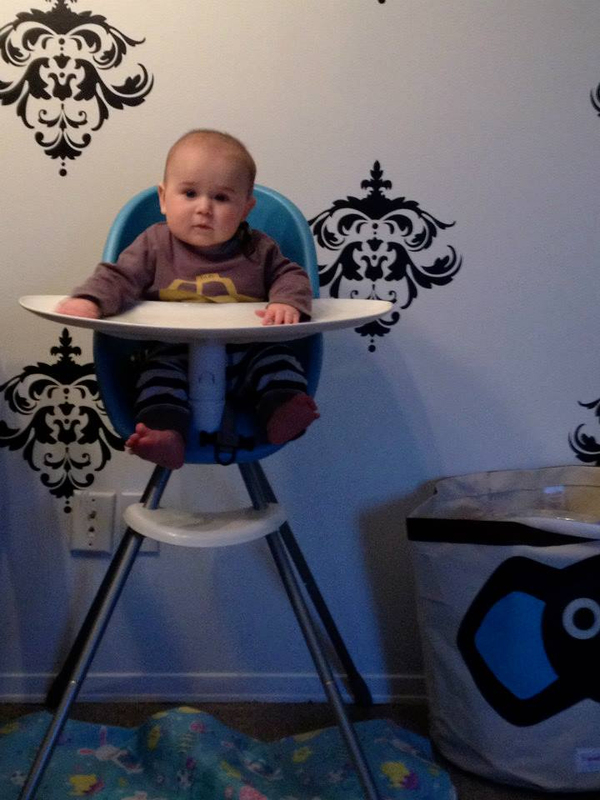 One friend of mine also embeds the image of the work. I was able to find all that information when the situation above came up – date of sale, amount paid, method of payment, how shipped. 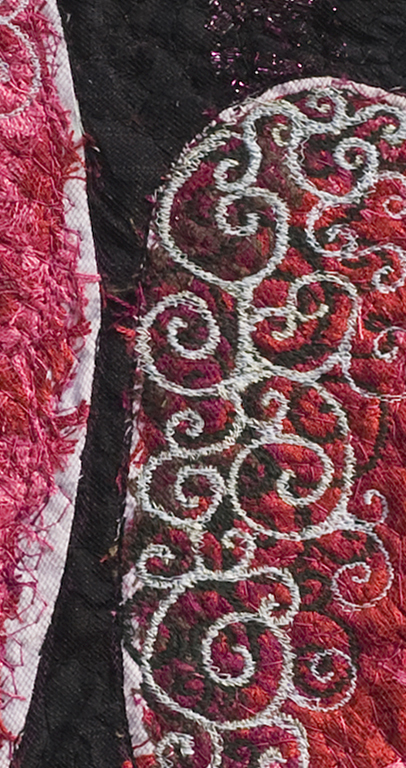 A section of an artwork record file. Once set up, these steps are easy to complete on a regular basis: one, two, three, four. Not only are you prepared for the worst, you are also organized and ready for the business of art. As for me, my episode with the dishonest artist was more of a curiosity than a downer. There wasn’t much to worry about really: it was an isolated case, by a perpetrator who was clearly unacquainted with basic art ethics (or perhaps any ethics at all). I mean really, what artist can get away for long with peddling other artists’ work? On the plus side, I was very pleased that my accurate records came in handy once again. In any case, theft, copying, and whatever else that comes up in the digital world will never stop me. As long as my body cooperates, my plan is to stay one step ahead. That’s what we artists have in our arsenal, a living well of creativity that will never be crushed. And we have each other. Let’s keep good records, take care of each other and stay vigilant out there! I invite you to share any other tips or stories you might have to help our art community below. Like my Facebook Page for further updates on this topic and other news. I was born in what is lovingly nicknamed the Banana Belt of Ontario. This flat, intensely agricultural area is nestled in by three lakes: Lake Huron, Lake Erie, and Lake St Clair. 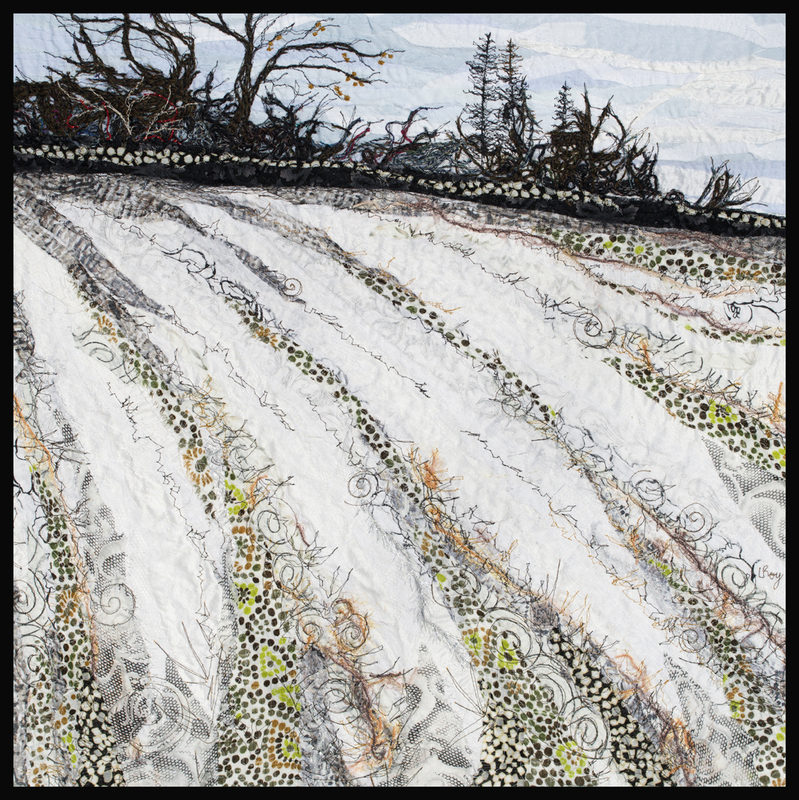 Despite the relatively warm climate, serious snowfalls were common, and I grew up loving the endless white expanses and tall accumulations against our farm buildings in winter. It was childhood heaven. 1. Contrast – what is life without it? We would never appreciate light if we didn’t know darkness. Or heat, without frozen fingers. I love black and white compositions. I made this sketch right after a local hike, using big markers to keep from getting too fussy. 2. Nature has fun with it – brilliant splashes of colour are more intense against a snowy backdrop. 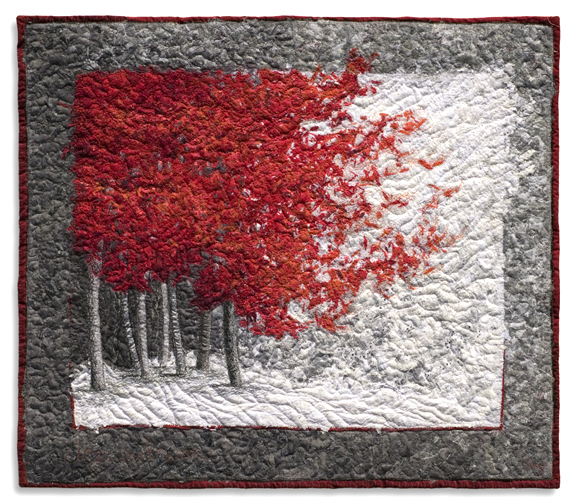 Red Maple 2008 28X32″ Net collage, machine embroidery, appliqué and quilting. 3. Native plants go to bed until spring – they need rest. Good example for all of us. 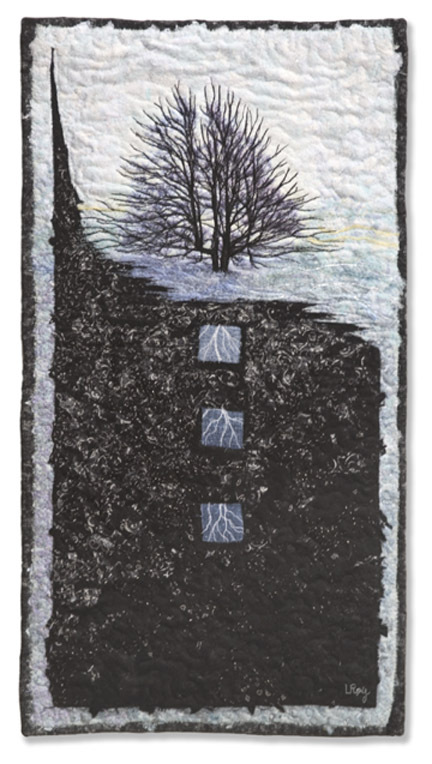 Dark Woods #10 2005 28X15″ Phototransfer of a tree, net collage and machine embroidery. 4. There’s more going on than the eye can see – stuff is happening under there. 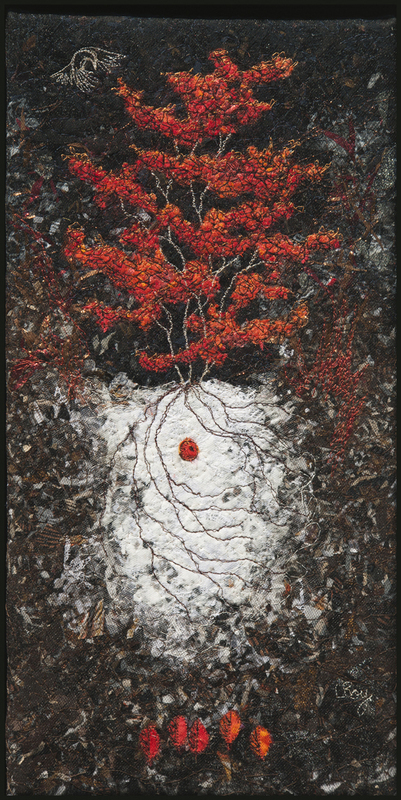 Fissure #3 2011 16X20″ Seeds, fungal spores, insects and other soil organisms burrow down, some die, some hibernate. Roots keep working. 5. You can see farther, especially if you are already short. 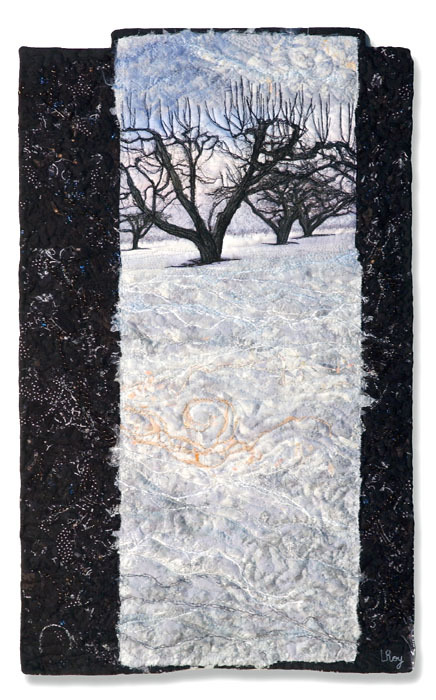 Deep Snow #5 2004 19X19″ Phototransfer of treetops, net collage and machine embroidery. 6. You don’t have to worry about deer eating your apples before you do. 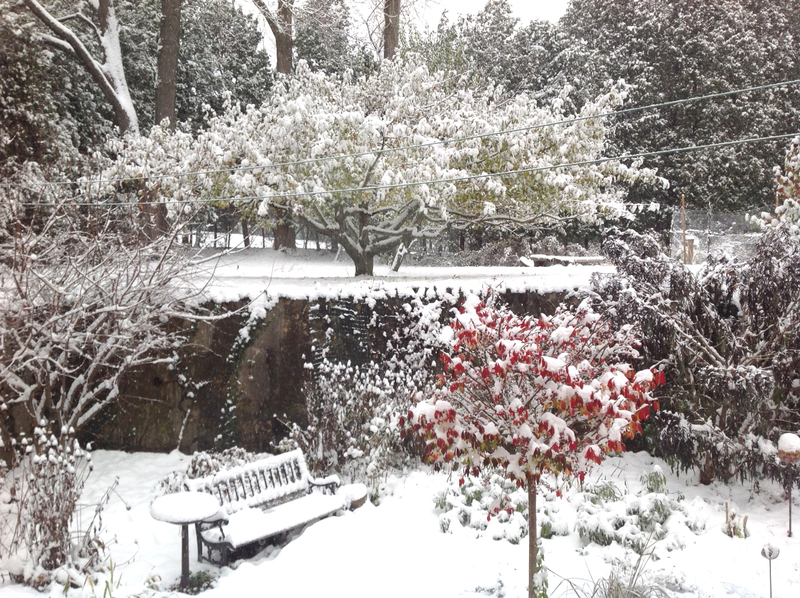 The view out my back window after an early snow. 7. Conifers are still working. They are at the helm! 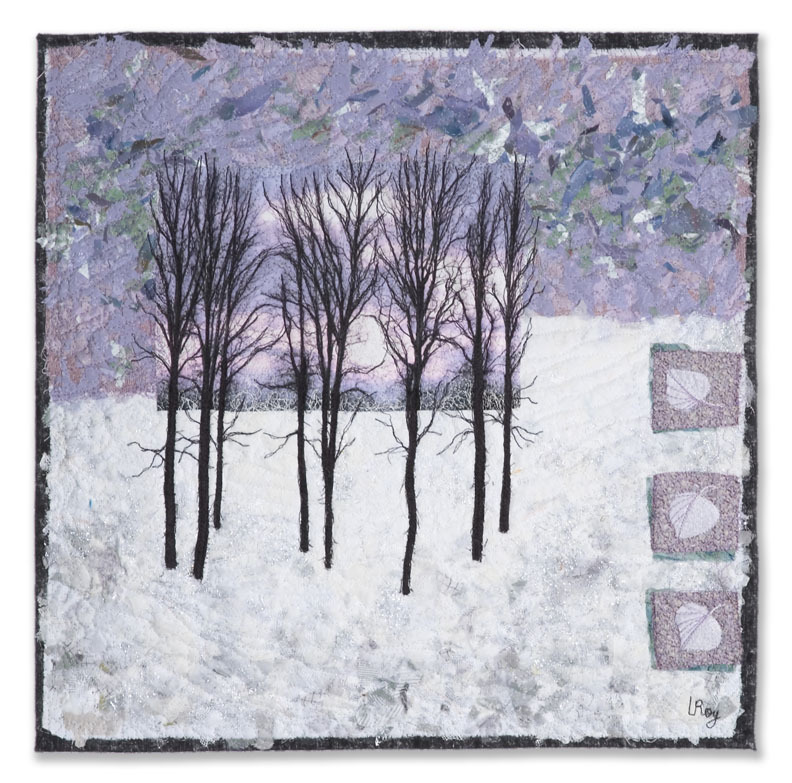 WINTER MOON #1 2010 12X9″ Conifer leaves are resistant to cold and moisture loss. On cold dry days, their needles curve in to reduce their exposed surface. They continue to photosynthesize, only more slowly, as long as they get enough water. 8. Night skies are enchanting. 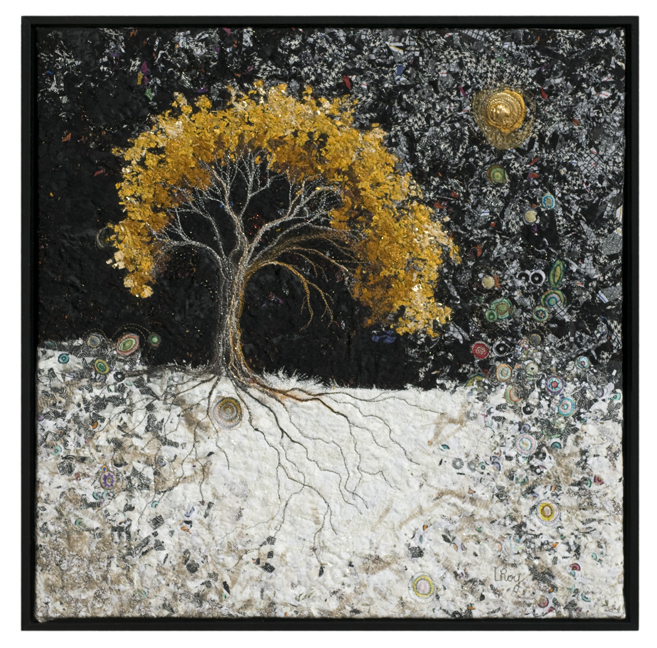 Trees I have Seen 2009 24X24″ Net collage, appliqué, machine embroidery. 9. Whether you love pruning or not, there’s no need to do it in February. You can, but you don’t have to. 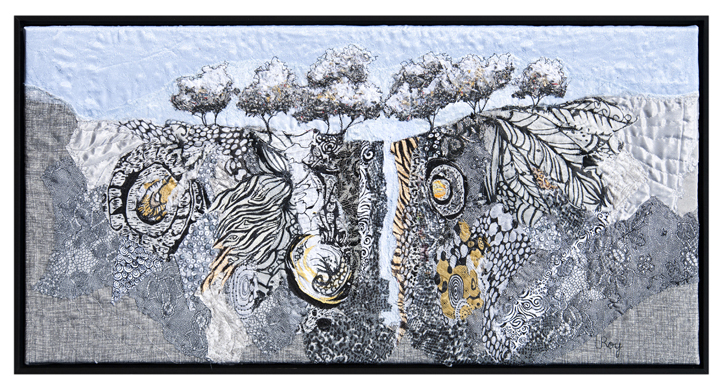 Old Apples #7 2004 28X17″ Phototransfer of trees, net collage, machine embroidery. Trees can’t chase their food, so they must count on resources harvested from their immediate area. Through the process of photosynthesis, they can feed themselves directly from the atmosphere using sunlight and carbon dioxide. But this chemical process also requires plenty of water … and for many trees, a consistent source is not always a given. From the fungal point of view, water is not a problem. Fungi have the ability to draw water from the most grudging of sources, even from the air itself. They also break down molecules into simpler nutrients that can be absorbed by tree roots. But they are not capable of creating their own food because they do not photosynthesize. Trees and fungi are meant for each other! It’s a lovely, romantic idea. But how exactly do these two very different species get together? How does the two-way transfer of water and nutrients work? 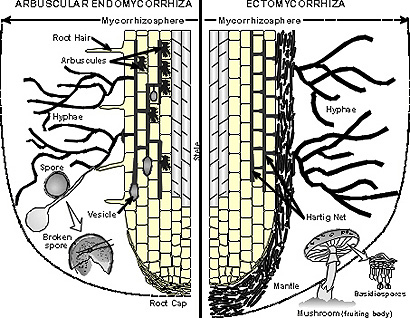 Cross section of root tip showing two different types of mycorrhizal colonization. 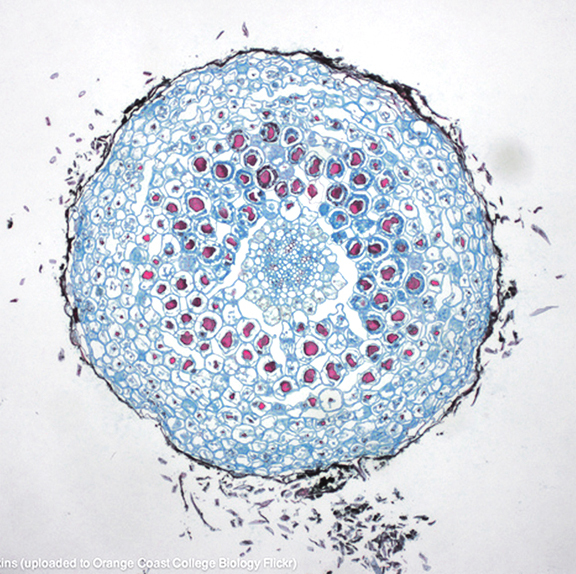 1) Arbuscular fungi start growing INSIDE root cells along the central core of the root. They are called Arbuscular because once inside the cells, they form tiny tree-like structures: trees inside trees! The large surface area created by their dense canopies is an efficient way to transfer water and nutrients. 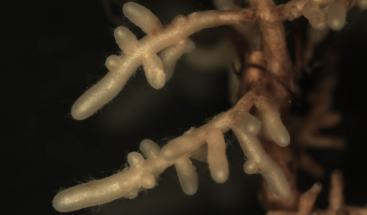 2) Ectomycorrhizal fungi spread their strands AROUND root cells, forming a 3-D spongy structure called the Hartig net. The tip of the root becomes enveloped with a pale mantle, easily seen with the naked eye. Some fungi are specific to particular trees – for example, Arbutus and Maple trees have their own favourite fungal species. But many fungi are non-specific and will colonize trees, grasses and many other plant species. Also, one tree may host several types of fungi at once. The established fungi maintain the flow of water and nutrients through fungal strands that connect their specialized inner root structures with the outer soil network, visible to us in the form of mushrooms and truffles. A pale swollen mantle is a sure sign of ectomycorrhizal activity on tree roots. But the best view of all is under the microscope. When tree rootlets are thinly sliced, treated with special dyes and magnified, it becomes possible to see exactly where and how the two species, tree and fungus, meet and mate. Electron microscope photographs are bizarre and beautiful, and these are no exception: a gold mine of ideas and eye candy. Below is one of many that drew my attention. Electron microscopic image. Arbuscular mycorrhizae are in fuschia. See how they’ve expanded like blobs inside the root cells? Photo by Marc Perkins. In this piece my intention was to stay true to the photo so I could learn to manipulate line and shape, but while working on it I began to see great potential for design and content. More adventures ahead in future posts! 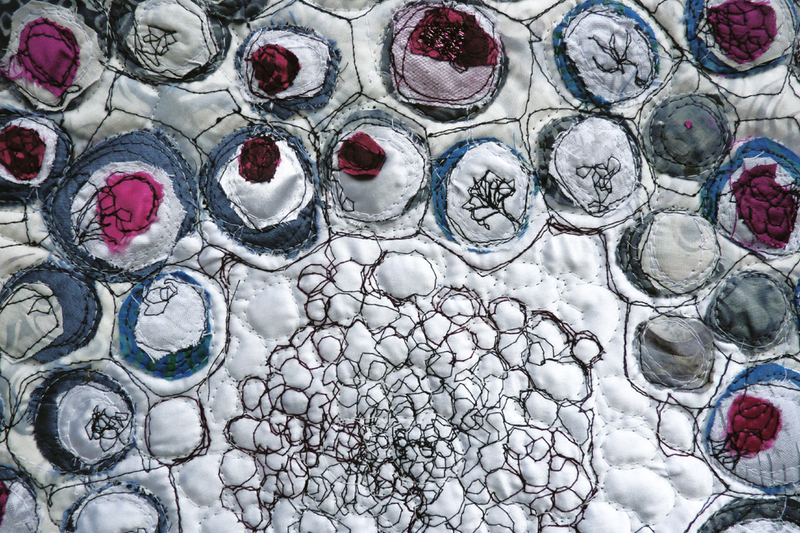 Detail from my quilted wall panel inspired by a cross section from a tree root with arbuscular mycorrrhizal fungi. 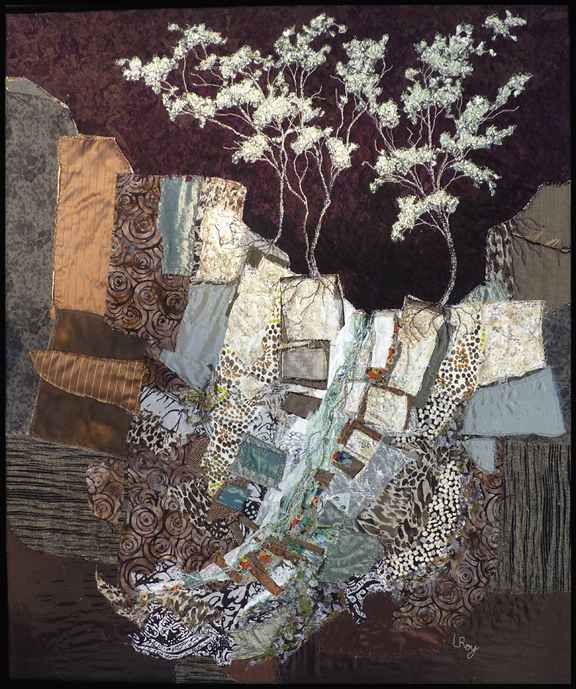 I used many kinds of materials, and the technique is machine collage, embroidery and quilting. Note the little trees! In my many years of tree studies, I’ve accumulated a vast and varied assortment of reasons to love trees. I present you here with yet another great excuse: larger trees in a forest actually protect and nurture seedlings and young saplings. It all begins with a complex system that involves specially evolved intermediaries called mycorrhizal fungi. Their fungal strands form an intimate bond with the tips of tree roots, and help the tree absorb water and nutrients. In return, the tree supplies the fungi with sugars. 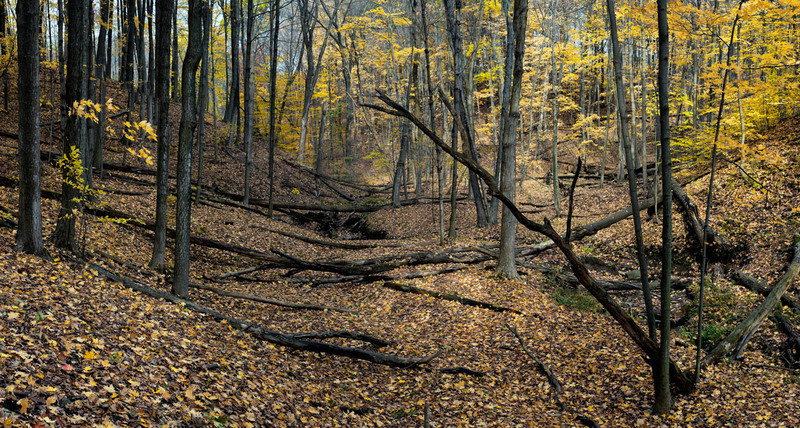 This network forms a dense mat in the top six inches of the entire forest floor, connecting all the trees in that location. Biologists have known about this root/fungus relationship for a very long time, but new research reveals even more fascinating material: the existence of Mother or Hub trees. In a dense forest, the germination and establishment of fresh trees is a challenge: larger trees take up most of the nutrients, and the canopy prevents penetration of light to the forest floor. Ground-level surfaces tend to be inhospitable, and soil quality is poor. What is a seedling to do? What else: it calls on its Mother. 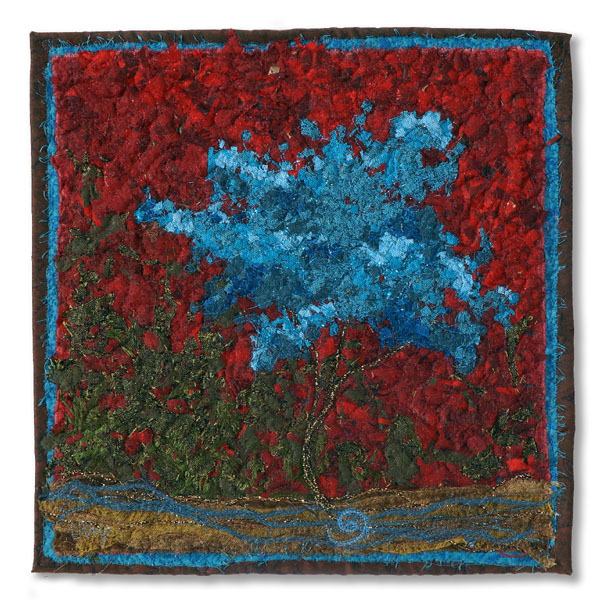 In effect, once a seed begins to germinate, it awakens components of the fungal mat that quickly colonize its roots. The seedling thus becomes linked with a large pool of nutrients that connects it to larger, older specimens that have access to light. The more shaded the area, the more resources a seedling can access. Saplings form strong fungal connections with large, mature trees. Image by Prof Suzanne Simard. 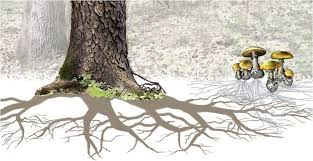 When a mature tree declines and begins to die, she sends her resources back into the network, and it is time for the younger trees to begin nurturing their own young charges. In even more recent studies, biologists are discovering that a mother tree actually favours her own offspring. At one of the research sites I visited in BC, Amanda Asay, PhD (Does kin selection play a facilitative role in regeneration of forests under climate stress?) was monitoring the survival rate of related and unrelated seedlings. How was this done? Several mature trees were harvested of their seeds. 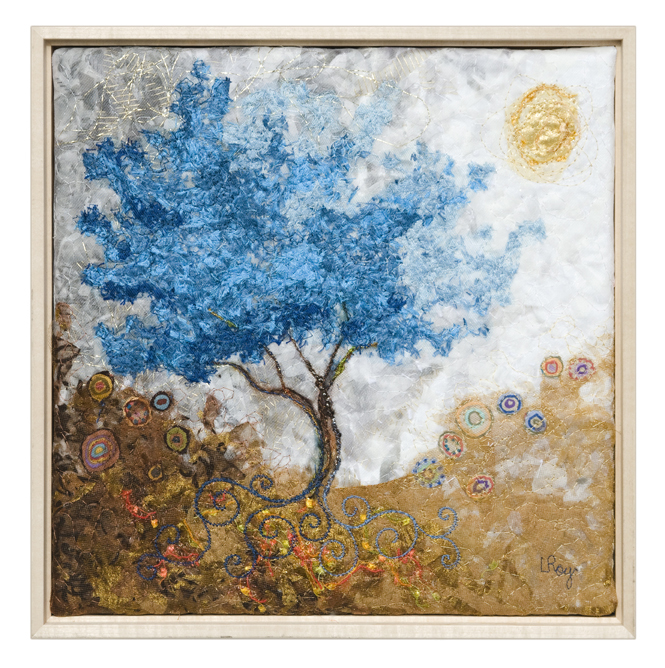 Around each tree was embedded a series of marked mesh bags filled with local soil, into which were planted either the tree’s own seeds, or those of others. Over the next few months, if bears and other wildlife hadn’t harvested them first, a tally of survivors was taken. 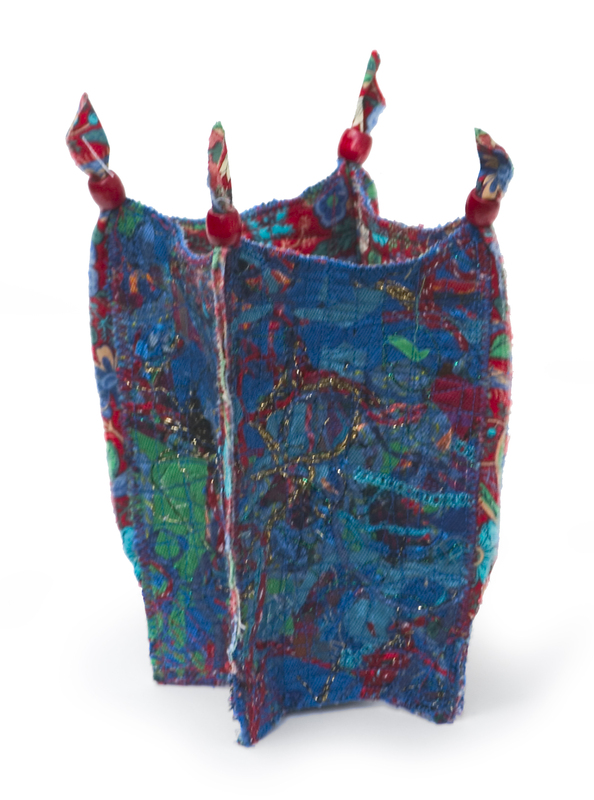 Here are a couple of those mesh bags. 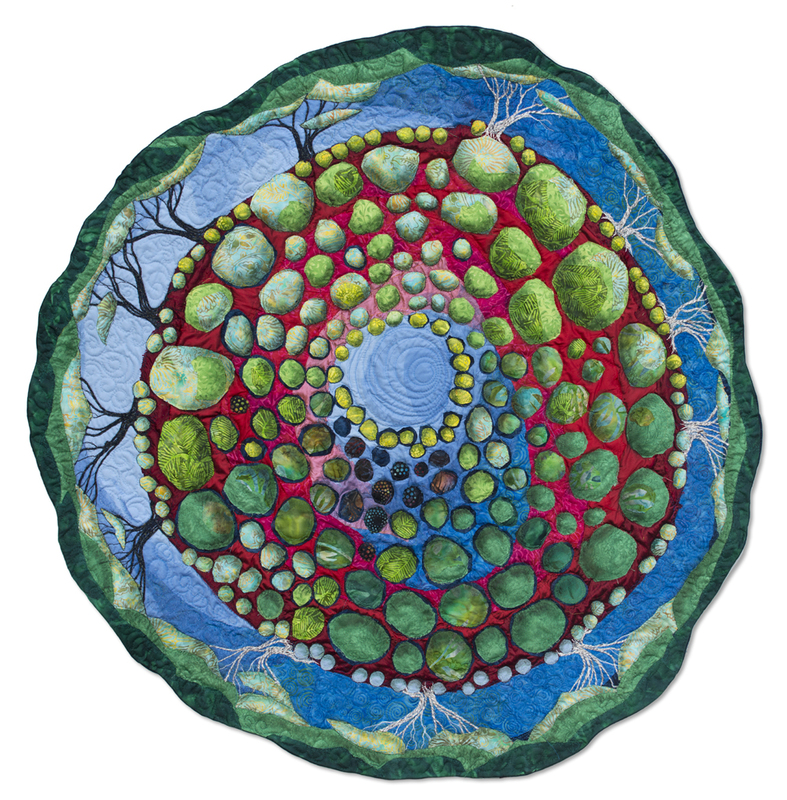 They are 8×5″ in size and allow fungi and roots to pass through. At the site, I had the opportunity to see how scientific research really happens. In the muddy trenches of boreal forest, after months of exposure to climate, pests, weed growth and just plain attrition, those little mesh bags were a challenge to find. 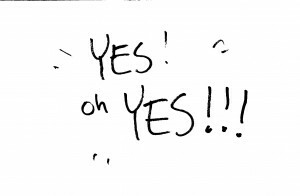 But yes! I found one! 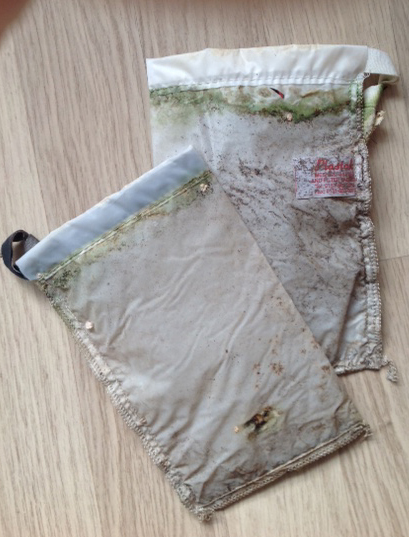 Then another, not too far away!… soon we were expert at detecting the minutest bit of white mesh buried in forest scruff. This and other adventures renewed my deep respect for biologists working in the field. Here we are visiting Amanda’s research site, looking for tiny mesh bags of seedlings. Amanda is wearing the red jacket. 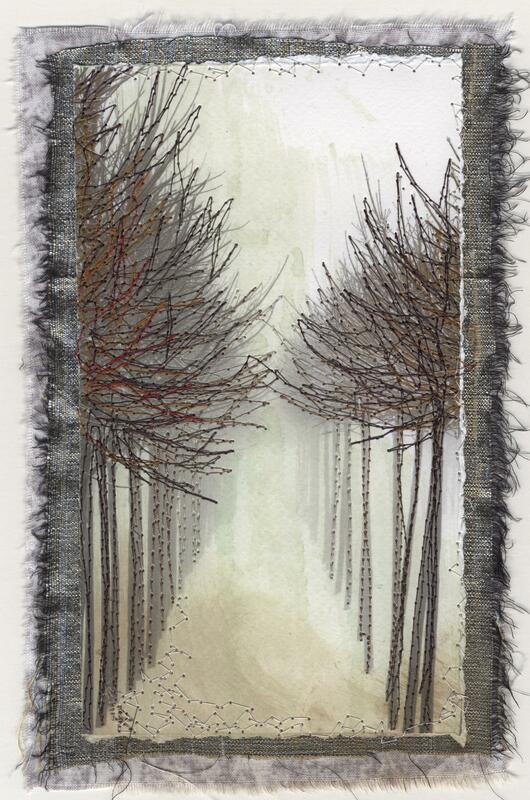 Of course, I love the idea that trees might be altruistic: it certainly captures the imagination. 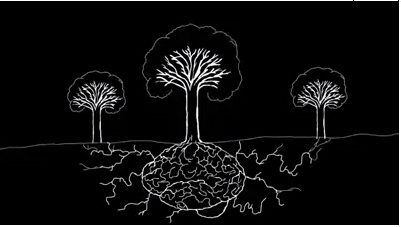 However, biologists are quick to share the truth: the evolution of the mycorrhizal relationship has much more to do with the health and survival of species and communities, than what we humans identify as true altruism. The chemistry behind these processes is well documented. Never mind! 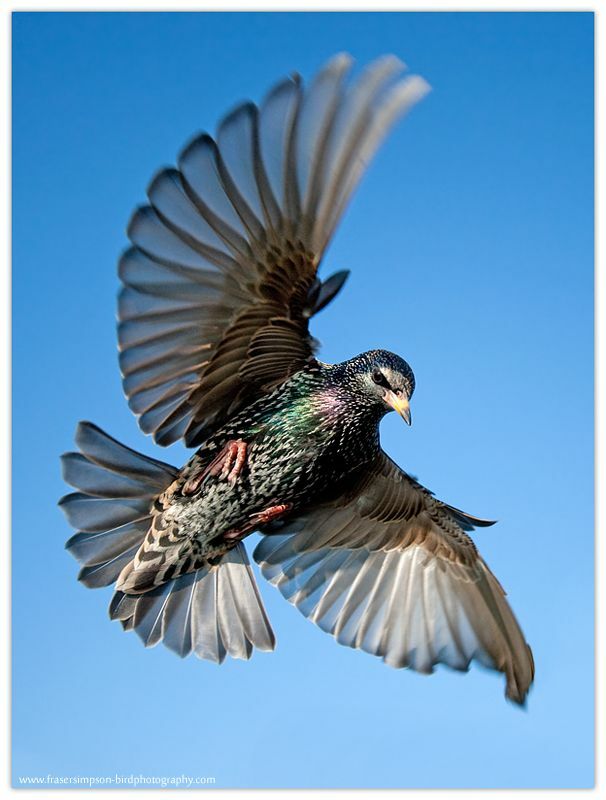 Scientific explanations are much richer and more engaging than any romantic notion I can come up with – eventually it all connects and makes its own wild beauty. Science is the real magic: as long as we have inquiring minds, our knowledge and appreciation of the world will continue to grow, and so will our sources of inspiration. Saplings thriving with the support of a mature tree in the forest. The fungal connections are just visible at the roots. Going somewhere? Start with a Map! Today is the second day of January 2015. Nearly a full year ago, I received a grant for a special project, mentioned in this blog. Much has happened since, and in the next few posts I am going to show you some of the developments. 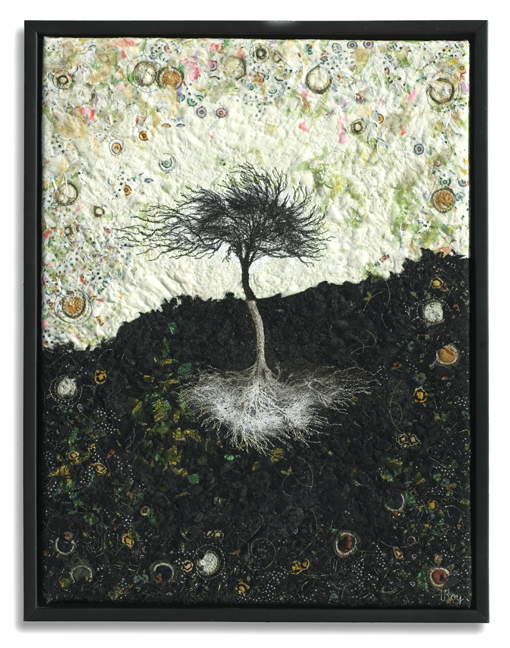 Just to recap: my new textile art project is inspired by recent scientific research on how trees share resources and communicate through their roots, with the help of mycorrhizal fungi. 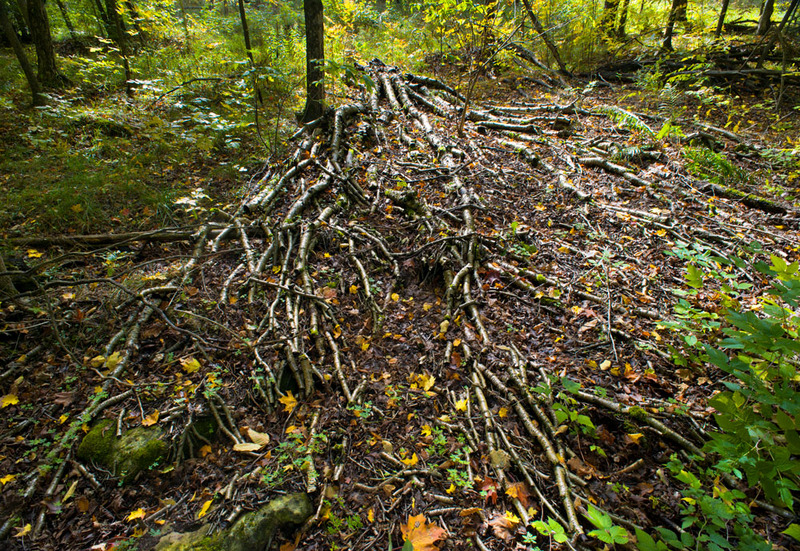 This amazing root/fungus system is important for most plants on the planet, but trees are especially dependent on this symbiotic relationship. In fact, without these fungi, trees would quickly die of thirst and starvation. Moreover, fungi not only help plants draw water, they also facilitate the transfer of nutrients amongst trees, and, even more amazingly, they actually deliver messages, even to other species (more about this later). It’s fascinating stuff, and the more I find out about it, the more inspiring it becomes. I am treating this project as a journey. It began the moment I first saw Prof. Suzanne Simard’s short video about her research. The ideas presented in this talk so aroused my curiosity that I couldn’t get it off my mind: MUST do something with this! With OAC grant in hand (or, more specifically, in bank) I could proceed with my itinerary. How does one begin a journey? Why, with a map of course! Mine is a unique map, the product of several years of research by Prof Simard and associates. 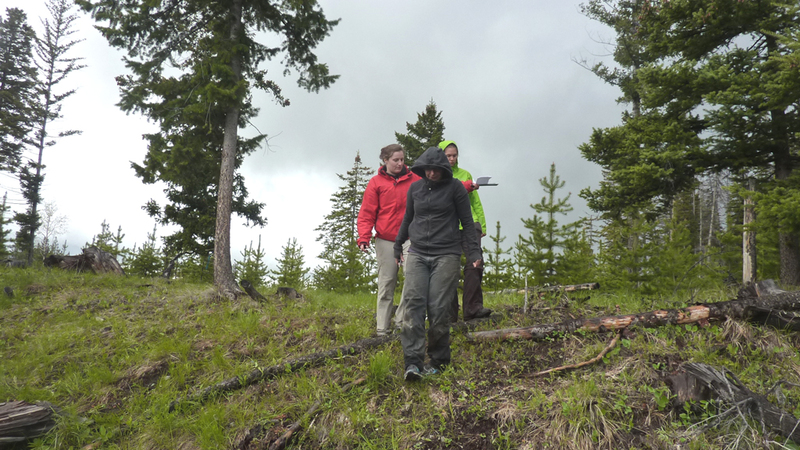 Using multi-locus microsatellite DNA analysis, they studied how two fungal species connected a group of Douglas Fir in a 30 m section of forest. 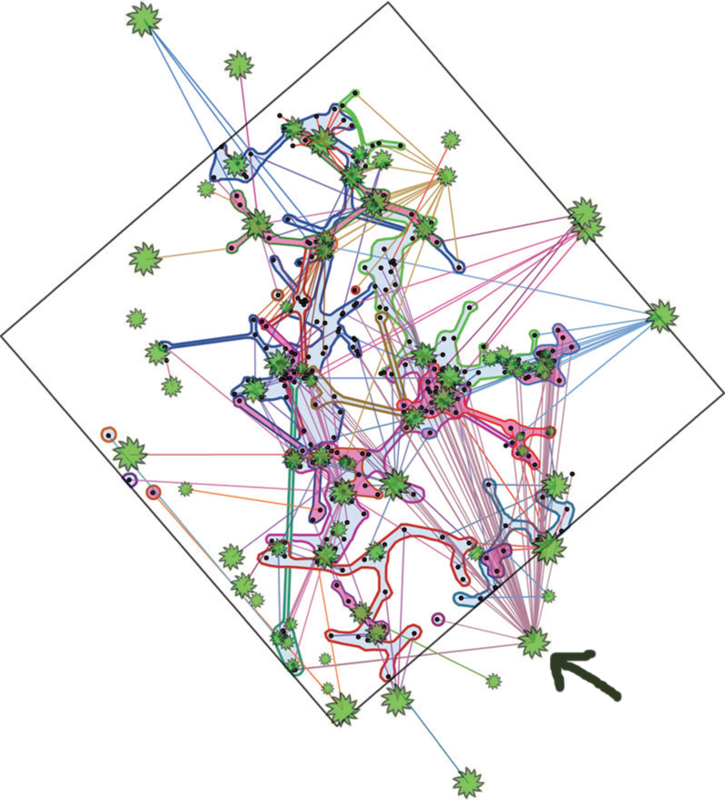 The green fuzzy dots represent trees, and the lines connecting them are the fungal paths. Even without much technical knowledge, it’s easy to see that the system is extensive and intricately woven. One tree was found to connect to 47 other trees (see arrow)! I wanted to see this for myself. From: Architecture of the Wood Wide Web New Phytologist (2010) 185: 543–553 www.newphytologist.org Reprinted with permission of the authors. 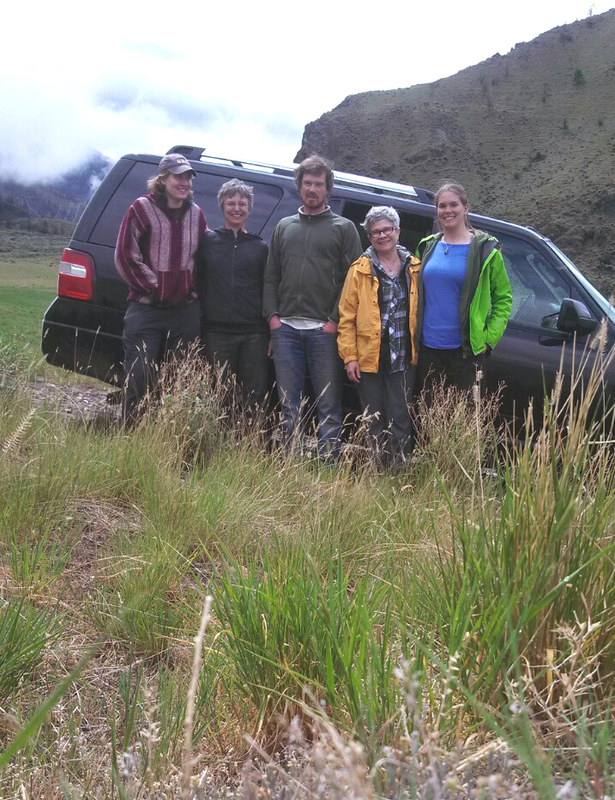 So, in May, I headed out to BC to meet Prof Simard and to spend four days with her and her generous grad students. 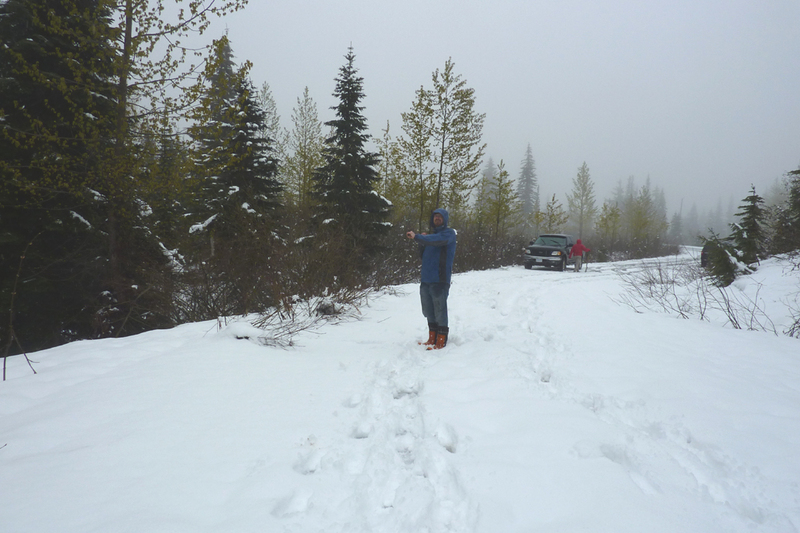 Wielding a shovel and gear, we drove through the mountains to locate and examine some of their research sites. Us and ‘Rob Ford’, our trusty SUV. Julia, Prof Simard, Deon, me and Melissa. It was an eye-opening experience – far from the shelter of the cozy lab, we encountered all the elements the mountains could throw at us, except for bears and bugs who were waiting in the wings for summer. 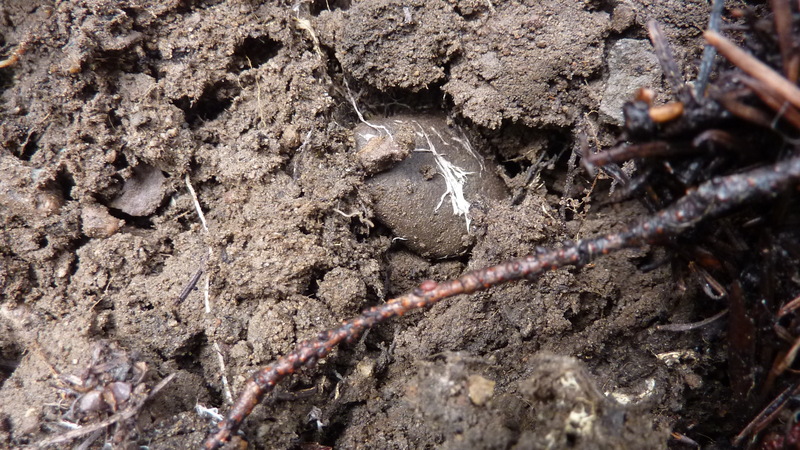 Undaunted, we dug up some fascinating root/fungal structures. The white fungal strands connect one set of tree roots with another. We also spent time in the lab (more about this in a future post). When I got home I had plenty of material to ponder. For the past ten months I experimented with lots of crazy ideas and materials, came up with a plan, and in November began to approach public galleries with the proposal. In the next few blogs, I will share some of the ups and downs and images of the process. Every journey implies a destination, and mine is a touring exhibition in 2017 called Woven Woods. Below is my first interpretation of the Schematic map of the Douglas Fir research site. In it I stitched as many words I could find that meant ‘connection’. My initial intent was to make a very large version of this piece as part of the exhibition, but this idea did not make the cut. Perhaps for a future project? 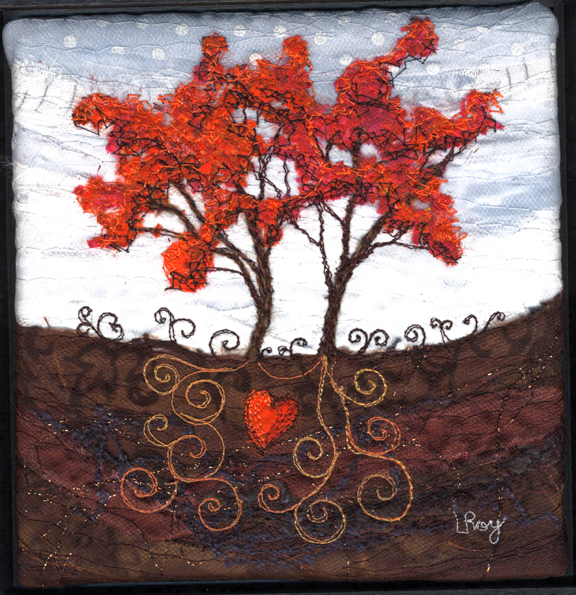 I have used trees as inspiration for my art for a very very long time. 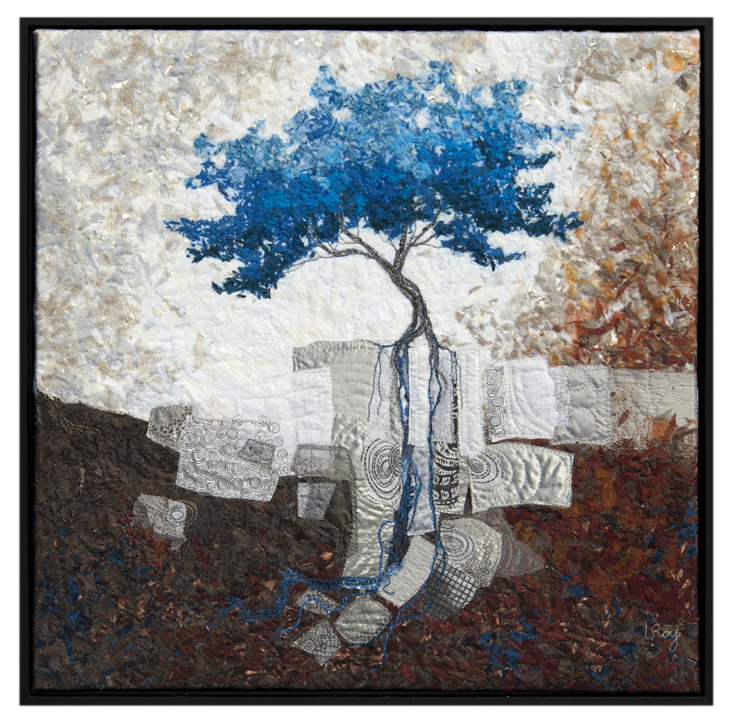 It’s a tremendously engaging subject for many reasons, but the tree is also incredibly flexible as a motif. Many designs require a great deal of research, but I must admit, on many occasions, I just sit with a glass of wine and a pencil, start to doodle, and voila, without really much thought, out comes something new. My blue trees are a case in point. The first one appeared years and years ago. 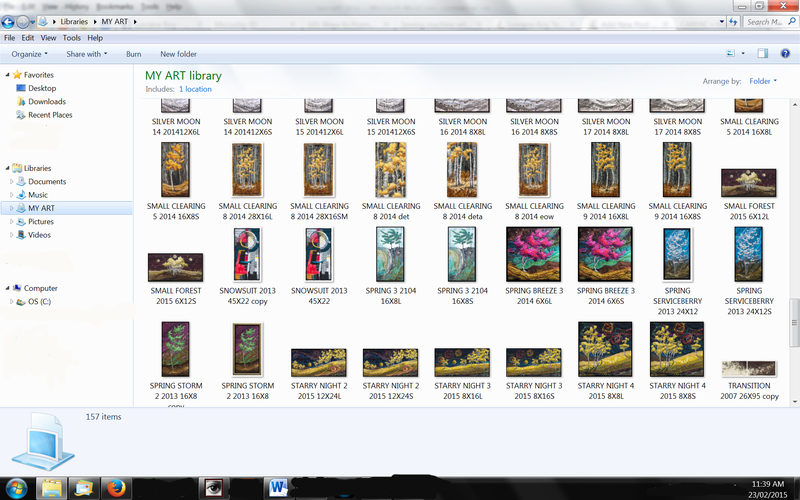 Since then, the ‘collection’ grew whenever I felt the need to ‘get off script’…. 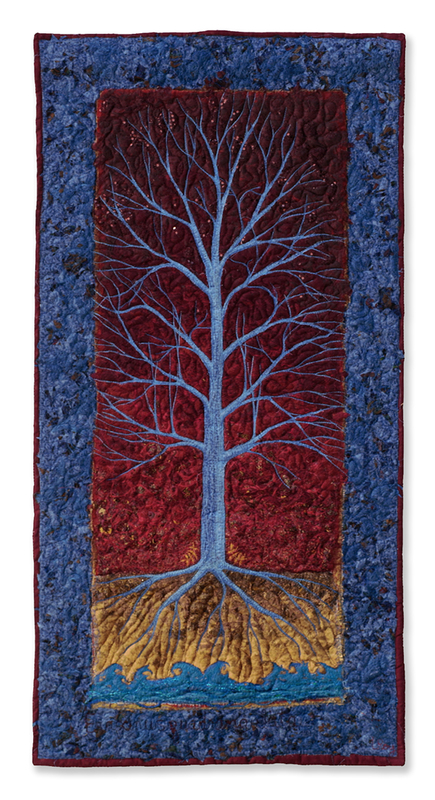 Hey, when you make a blue tree, you don’t need to worry about the practical stuff … no holds barred. So today I will show you a bunch of them, most of which are not on my website, and hope you enjoy! 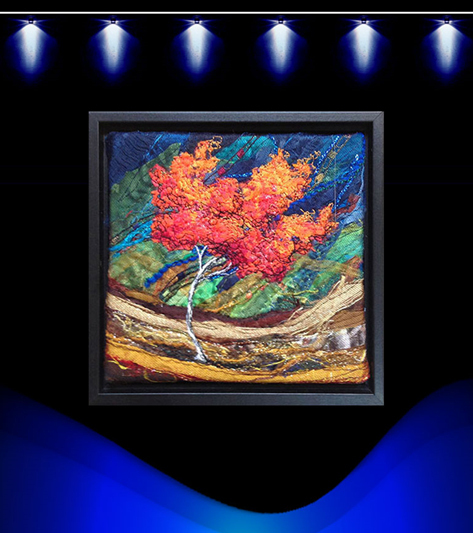 This was part of a touring exhibition inspired by rare and endangered trees of Ontario. There were 17 in the collection… and this one was stolen at one of the venues. I made another one to replace it…. but sadly, the first was never recovered. 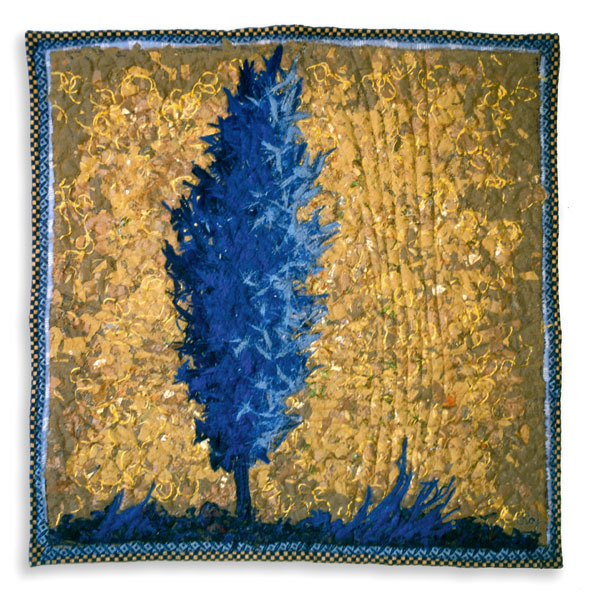 This may be my first blue tree, made when I was living in Quebec City, and it’s still there, somewhere…. 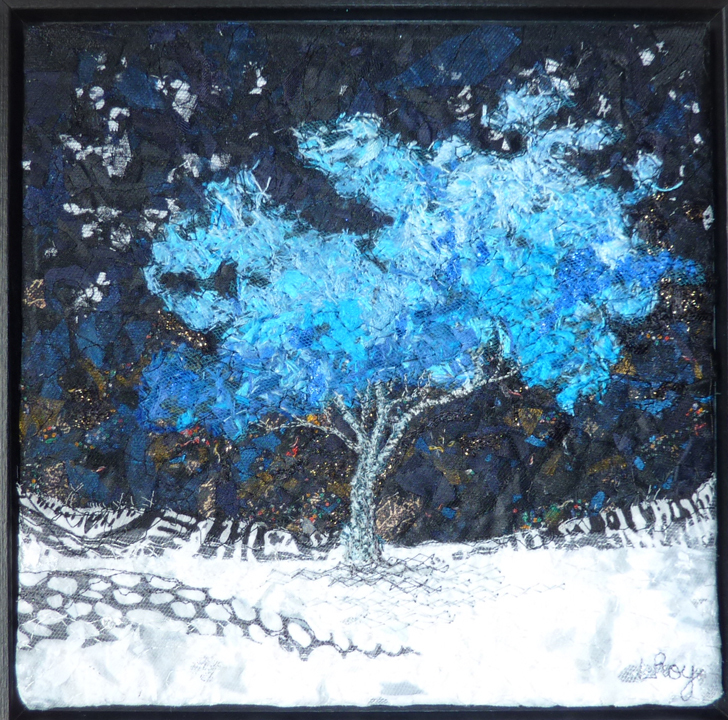 A blue tree just belongs in the snow at night. 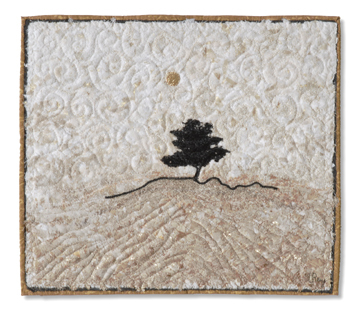 One of the first from a very long Fertile Ground series. I can still remember my excitement at this new direction in my work! From a grouping of ten, all the same size, but all different colours. 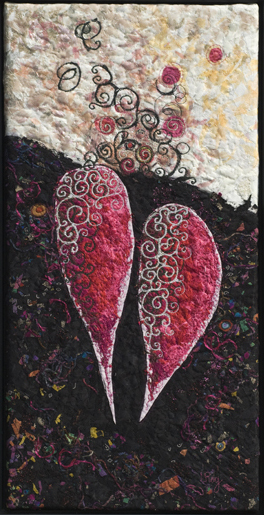 An early version from my Fertile Ground series. The courage to be blue. What are they about? What can they mean? Do we really need to know? One of the perks of being an artist is the freedom to create your own world. Mine has blue trees in it. What colour are yours? 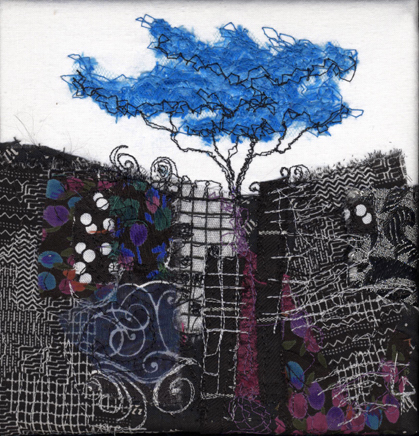 Oh little blue tree! Doesn’t need a thing more to be happy. Last Monday evening I presented a slide lecture for the Hamilton Naturalists’ Club at the Royal Botanical Gardens in Burlington. 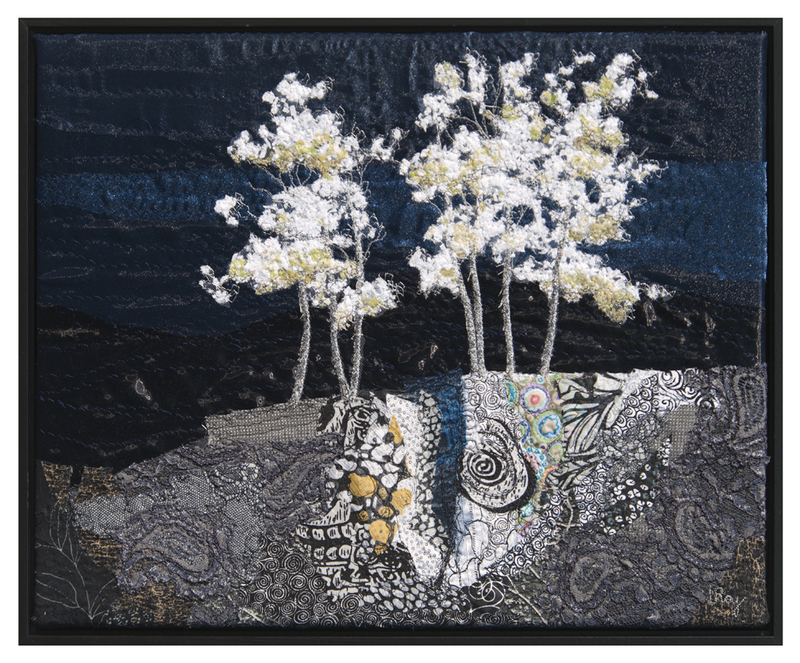 The title was “Roots and Rocks: From Darkness to Light”. 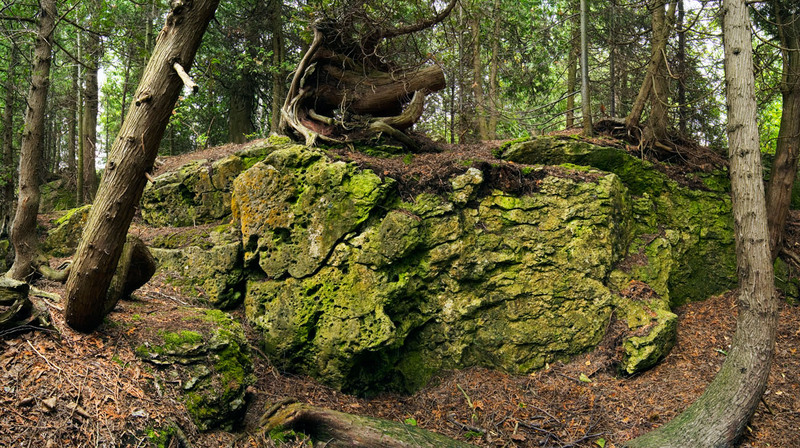 It was a talk that meandered through various themes I’ve been working on for the past few years – trees, rock, soil, roots and what happens beneath the surface. Sure, Roots and Rocks, obvious title! But why the qualifier, From Darkness to Light? A while back I found an intriguing video of my hero, Canadian author Margaret Atwood, being interviewed by Lorna Dueck, in an episode of Context called “God’s Gardeners”. She was accompanied by Leah and Markku Kostamo who head the Canadian branch of an international environmental organization called A Rocha. It was classic Atwood, filled with her wry wit and plenty to sink one’s teeth into. (I also loved how she nimbly fielded a barrage of cringeworthy questions – I digress, ahem) But the most significant question came at the end. What can each of us do, as individuals, to help make the world a better place? The first two points, although harder to put in practice than they sound, are no-brainers, elegantly tying together many issues of rampant consumerism that is eating up our beautiful Earth. But it’s the third point that hit home with me, and I am going to tell you why. Go out and name your world. As a horticulturalist and science-a-holic, I love learning the names of the wild things I come across. A snazzy new plant? What can it be? I get a good look, grab a leaf, and head home in a hurry to look it up online or in one of my books. Once it’s got a name, I can’t help but ponder: What is its life story? Where else does it grow and where does it come from? What bugs does it host, what animal does it feed? What do its seeds and flowers look like? Does it have medicinal properties? It all begins with naming. And I would never have met this plant had I not first ‘gone out’ and explored my surroundings. I would never have had the opportunity to love it. 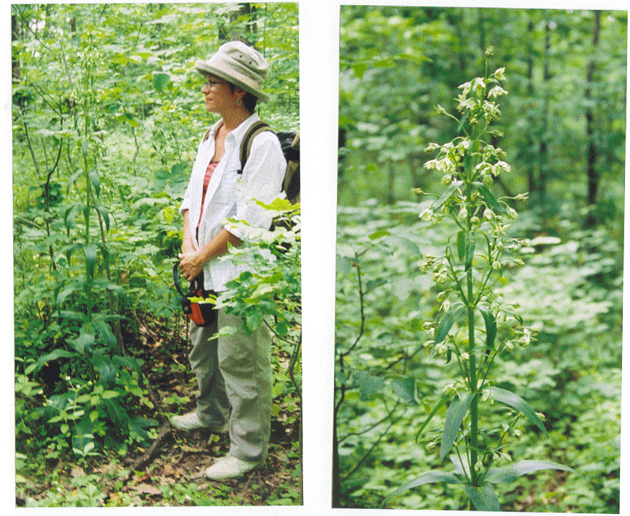 Me and the rare Columbo plant enjoying a staring contest at Cartwright Sanctuary near Dundas, ON. However, many things in our natural world are not so easy to name. They can be too small to see. They can be hidden deep inside the bark of a tree or up in the branches beyond reach. They can be nocturnal or secretive or shy and complicated. And they can be buried and tangled deep in the soil. Enter our biologists: dedicated individuals who devote the full force of their knowledge, time and resources to uncharted territory. Where would we be without these scientists, naming and knowing more and more of the wonders of our universe? But herein lies a problem. Scientists work hard… but their skill set may not always include effective communication beyond what is necessary to spread the word amongst other scientists. And really, we can’t expect them to do it all, can we? In comes Opportunity! With a science background, love of nature, and passion for imagery, could I become a visual spokesperson though which a scientist can share discoveries? Yes. This is what I want to do. This is why I called my lecture Roots and Rocks: From Darkness to Light. 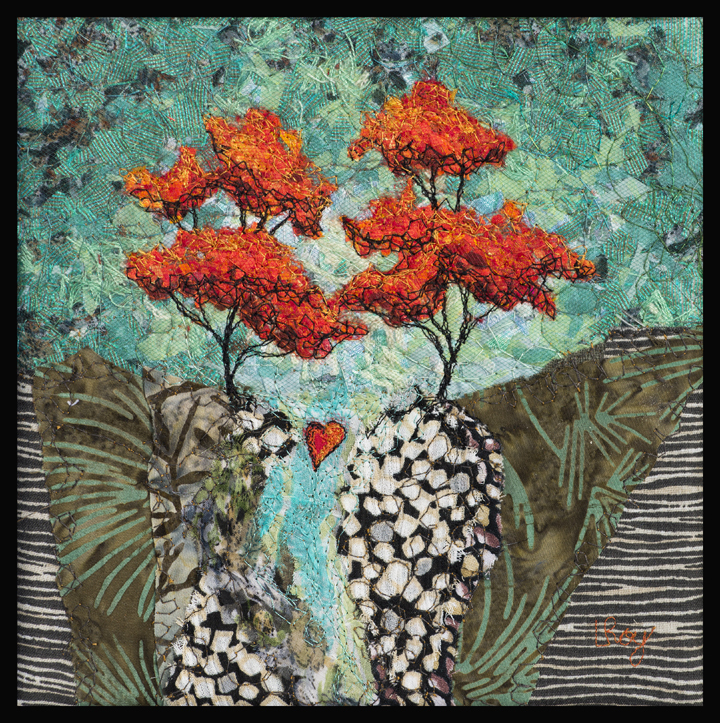 To me, art making is an all-encompassing and spiritually fulfilling quest. I hope to leave the world a better place: to bring to light these hidden worlds in such a way that others can see, feel and marvel as I do. Because we can’t love something until it has a name. “Even the darkness is not dark to You.